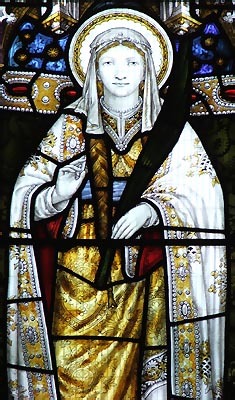 St. Tudfyl was one of the many daughters of King Brychan Brycheiniog. She was a good Christian and travelled across South Wales, founding churches at Merthyr near Carmarthen and Llysworney near Cowbridge. While visiting her aging father at what is now Merthyr Tydfil in Morgannwg, the palace was attacked by a raiding party of pagans, either British or Saxon. Tudfyl was killed in the raid and her distraught brother, Rhun, mustered a force of men to pursue their attackers. They slew the majority of them in a battle by the river crossing at Pont Rhun. Unfortunately, however, Rhun himself was killed there at the very moment of victory. Tudfyl's feast day is 23rd August.